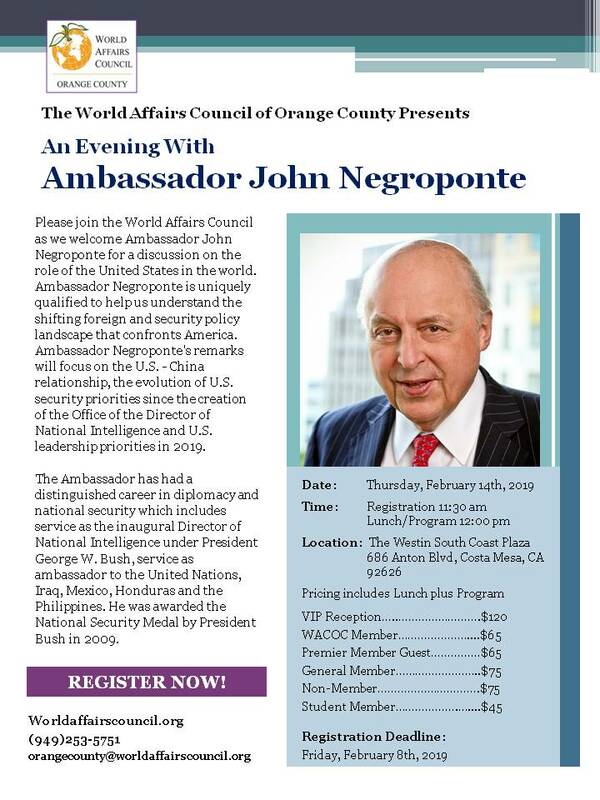 Please join the World Affairs Council as we welcome Ambassador John Negroponte for a discussion on the role of the United States in the world. Ambassador Negroponte is uniquely qualified to help us understand the shifting foreign and security policy landscape that confronts America. Ambassador Negroponte’s remarks will focus on the U.S. – China relationship, the evolution of U.S. security priorities since the creation of the Office of the Director of National Intelligence and U.S. leadership priorities in 2019. The Ambassador has had a distinguished career in diplomacy and national security which includes service as the inaugural Director of National Intelligence under President George W. Bush, service as ambassador to the United Nations, Iraq, Mexico, Honduras and the Philippines. He was awarded the National Security Medal by President Bush in 2009.